Satellite virus: The virus needs a helper virus for viral replication. Infection requires host cell to be co-infected with a virus from the genus Tobamovirus. Non-enveloped, spherical, T=1 icosahedral capsid, about 17 nm in diameter. Sixty copies of the capsid protein form the capsid. Linear, ssRNA(+) genome of about 1 kb, which lacks a cap structure and a poly(A)tail. The virion RNA is infectious and serves as both the genome and viral messenger RNA. Encodes one capsid protein and an unknown ORF. 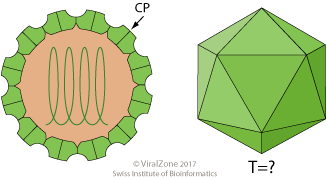 The viral RNA is translated to produce the capsid protein. ETYMOLOGY Vir for virgavirus (helper virus), to for tobacco.